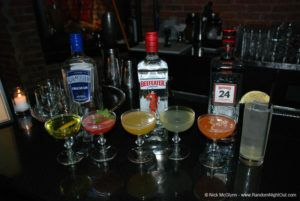 “We’re here to showcase the versatility of gin,” said Sarah Bessette, Director of Public Pelations for Pernod Ricard www.pernod-ricard.com. Bessete’s go-to drink: a classic Plymouth Martini. Also served were cocktails made with Beefeater, and the newest member of the portfolio, Beefeater 24 www.beefeater24.com. 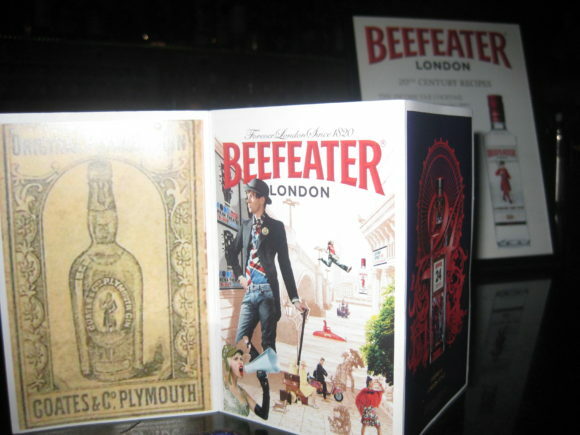 In addition to their signature blend of nine botanicals, Beefeater 24 includes grapefruit peel, Chinese green and Japanese sencha. The evening’s menu featured classics like the Last Word to the spicy, sweet London’s Calling, made with coriander and paprika-infused grapefruit. Simon Ford and Jamie Gordon were among the men behind the bar, and the evening ended with a spirited toast in honor of Mr. Gordon’s birthday. 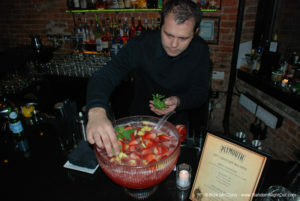 While snow accumulated outside and temperatures dropped in the East Village, the inviting atmosphere of Summit Bar and delicious gin cocktails served ensured that all in attendance enjoyed a warm and spirited evening. Stir with shaved ice and strain into a cocktail glass (preferably a coup). Garnish with a cherry and a squeeze of lemon peel for the oils. Peel, slice and cut pineapple into a glass bowl, add the juice of two oranges, raspberry syrup, maraschino, Plymouth™ Gin, a bottle of sparkling wine and a pound of ice; mix and ornament with seasonal berries and serve in a flat glass. Combine all ingredients in mixing glass. Add ice. Shake and strain. Garnish with an orange twist. Combine all ingredients in mixing glass. Add ice. Shake and strain. Garnish with a maraschino cherry. *To make chardonnay honey syrup, use one part chardonnay, one part honey and one part water; then add in a few coriander seeds. Shake and strain into a coup glass, and garnish with discarded zests of grapefruit and lemon. *To make chamomile syrup, use one part strong chamomile tea and one part sugar. Add Beefeater 24™, lemon juice, and chamomile syrup to a mixing glass and shake with ice. Pour over fresh ice into a highball glass, and top with lavender soda. Garnish with a lemon wedge and chamomile and lavender flower.